Revkin asks: “Same as it ever was?” No, it’s not. The White House tampered with language in a controversial Interior Department report on its deepwater drilling moratorium, implying a group of independent scientists supported language recommending the ban, according to the agency’s watchdog. At issue is the May 27 report on oil and gas drilling safety that was compiled at President Obama’s request after the Deepwater Horizon drilling rig exploded in the Gulf of Mexico, sparking the nation’s worst oil spill. The report made several recommendations for safety improvements at offshore drilling rigs and called for the six-month ban on deepwater drilling and permitting. Interior Secretary Ken Salazar tapped 15 experts to review the safety recommendations made in the main body of the report, but they never endorsed the moratorium and later blasted Interior’s use of their names to support the ban…. Interior Inspector General Mary Kendall said the White House made the changes during the editing process implying the advisers had reviewed the moratorium language…. While the inspector general’s account says the report could have been “more clearly worded,” it does not fault Interior or the White House for deliberately misleading the public…. Interior spokeswoman Kendra Barkoff also said there was no intent to mislead the public. “The decision to impose a temporary moratorium on deepwater drilling was made by the secretary, following consultation with colleagues including the White House,” she said in an e-mailed statement. The original moratorium discussed in the May 27 report was overturned by a federal judge in June, but Interior quickly imposed a new ban in July. That suspension ended last month. Mary L. Kendall, the Interior Department inspector general, interviewed all the officials involved in preparing and editing the report and reviewed the e-mails between Interior and the White House in the final hours before the report was issued. She found that officials in the office of Carol Browner, the White House coordinator for energy and environment, had changed some wording and moved around some of the report’s findings in a way that made it look as though the independent scientists had endorsed the moratorium recommendation. Officials from the White House and Interior told Ms. Kendall that they had not intended to do so. White House officials always tinker with the language in reports relevant to policy. For the most part, such efforts are aimed at avoiding problems. But they sure can backfire. During the Bush administration, reports dealing with global warming got a thorough going over, as I reported in detail in 2005 and periodically earlier than that. The goal, revealed in hand-written editing marks, was clearly to amplify uncertainty and remove verbiage that smacked of definitiveness. Now a much-discussed report by the inspector general of the Department of Interior shows how officials in the Obama White House were responsible for a last-minute change in the language of a document on deep-water drilling safety that formed the basis for President Obama’s controversial decision in June to enact a six-month deep-water drilling moratorium …. Obama administration officials last night stressed that they had publicly acknowledged the faulty wording as soon as the complaints brought the issue to light, saying it was unintentional and that apologies were made to the review panel (these points were acknowledged by Kendall). That’s a more creditable stance than the one taken by President George W. Bush’s staff after the disclosures of edits to climate reports. But it sure is hard to read the drilling safety report — which sits unchanged on the Web with nary an asterisk to indicate the problem — without concluding that the purpose of the editing was to give the perception of scientists’ and engineers’ support for the moratorium. The Secretary [of Interior] also recommends temporarily halting certain permitting and drilling activities…. The recommendations contained in this report have been peer-reviewed by seven experts identified by the National Academy of Engineering. The White House properly coordinated review for a draft document, incorporating comments and feedback from White House offices and other agencies with expertise. Following a review that included interviews with peer review experts, the Inspector General found no intentional misrepresentation of their views. The IG further found that to the extent that there was any misunderstanding of their position, Interior acted quickly to correct it. The decision to implement a 6-month moratorium on deepwater drilling in the Gulf of Mexico was correctly based on the need for adequate spill response, well containment and safety measures, and we stand behind that decision. 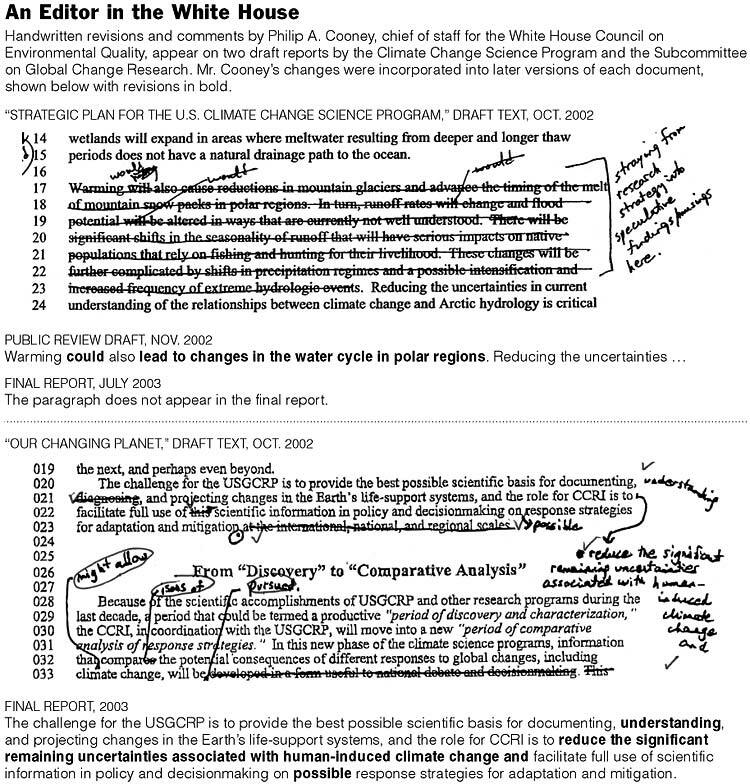 Here’s how the Bush White House explained the edits of climate reports in 2005. Well…no. The situations are by no means the same. Revkin could explain and acknowledge this more usefully if he didn’t frame the issue quite so narrowly. In the case under consideration here, it appears that Carol Browner’s office in the White House edited a statement to appear, misleadingly, to put science on Obama’s side in what was, in effect, a policy and political decision. Without attempting to resolve here whether the drilling moratorium decision was correct, and without being privy to their internal editing process, suffice it to say they’re entitled to their policy, but not to misrepresent a scientific advisory group to suit political tactics – if that’s what they did. But let’s put the matter in perspective. Revkin frames the question of the Bush-Obama comparison much too narrowly by focusing on the case of the oil industry lobbyist in the White House Council on Environmental Quality editing government climate reports to play down the global warming problem – which he did, of course, much to his discredit. And much to Revkin’s credit for covering this particular story so well. Restrictive communication policies that included efforts to prevent federal climate scientists and other researchers from talking to journalists about their findings. This included, most notably, the discredited attempt to muzzle Jim Hansen of NASA, as well as restrictions on Tom Knutson at the NOAA Geophysical Fluid Dynamics Lab, Jim Titus at EPA, and others whose cases received no press attention. A corollary tactic was to avoid or delay press announcements of research findings and responses to press inquiries as a means of blocking or discouraging public communication. Censorship and politically motivated restrictions on congressional testimony by administration officials, most notably the removal, at the behest of Vice President Cheney’s office, of all substantive material from Senate testimony by Centers for Disease Control and Prevention director Julie Gerberding, on the public health implications of climate change. Misrepresenting to the media the state of scientific discussion on the potential relationship between anthropogenic climate change and increased intensity of hurricanes. The promotion of a political culture in the federal agencies that involved multiple additional forms of interference with federal scientists, particularly with regard to communication beyond the confines of the technical scientific literature – reportedly in hundreds of instances, as documented in surveys and case analyses undertaken by the Union of Concerned Scientists and the Government Accountability Project. Official suppression of the use by federal agencies – and even references to – the National Assessment of Climate Change Impacts, a major study that was praised by the National Research Council. The National Assessment involved the efforts of hundreds of scientists and other experts, who produced a body of reports that was the most significant effort ever undertaken to establish a scientist-stakeholder interaction and assess the potential consequences of climatic disruption for the United States. In my view this was the central climate science scandal of the Bush administration. I believe it is more significant – substantively, if not in the ease of concise and elegant framing as a narrative — than the iconic fox-guarding-the-henhouse White House editing that Revkin made the focus of his story covering my disclosures. The suppression of the National Assessment, and most importantly the process it had initiated, sent a cold message to those who had worked on it and placed value on it, and was part of a larger default on linking climate science to U.S. policymaking, especially on adaptive preparedness to climate change impacts. Collusion with the global warming denial machine on the resolution of litigation in favor of the denialists, in particular on the lawsuits pertaining to the National Assessment by the libertarian (i.e., corporatist) Competitive Enterprise Institute. The list goes on. The issues have been discussed and documented in detail on this website and elsewhere. I summarized them in my article “The Denial Machine,” published in Index on Censorship; in numerous interviews and talks; in congressional testimony before House and Senate committees; in a federal lawsuit Declaration; and so forth. Revkin wrote some good articles based on information provided by myself and Jim Hansen. But much of the rest of this complex, interwoven story came out as a result of investigations conducted by Rep. Henry Waxman’s (D-California) staff on the House Oversight and Government Reform Committee, by public interest groups, by journalists writing in Rolling Stone and other publications, as well as in testimony and statements by government scientists and officials. Much of it was not covered in any detail in the Times. So, even apart from the Obama administration’s quick acknowledgement of and apology for their error on the drilling moratorium statement, I believe the case of their misleading sentence is truly inconsequential compared with the Bush-Cheney administration’s eight-year-long, multifaceted campaign of censorship, denial, and general misrepresentation of the scientific intelligence on the threat of global climatic disruption. Bush-Cheney repeatedly subordinated scientific integrity to politics – and to a wholly inadequate policy on climate change. With their lack of integrity and accountability they abdicated responsibility both on national climate change preparedness and clean energy — not to mention adding to the threat to vulnerable people around the world from official U.S. climate contrarianism and inaction. By framing his post to lead to the (“centrist”?) question, “Same as it ever was?” I think Revkin, in effect, feeds a “gotcha” mentality that, in this case, will be congenial to right-wingers. It’s not clear to me what motivates this, but I think it lacks a critical political perspective. I think we can hold the Obama administrration’s feet to the fire as necessary on proving their scientific integrity without suggesting misleading comparisons to their egregious predecessors. Revkin could and should have given a clear answer to his own question. 3 Responses to Revkin asks: “Same as it ever was?” No, it’s not. Jim Hansen and you, Rick, were very helpful, but hardly the only courageous people within the government who stood up to suppression and helped reveal the broad pattern of interference with the flow of scientific information. Several gutsy people at NASA, including contractors with no job security, were crucial in revealing this. This new incident related to the Gulf is isolated, sure. But it’s a glaringly clearly example of trying to exploit scientists’ and engineers’ views (and reputations) to bolster a policy outcome. That is wrong. Period. As for your complaints about censorship and intimidation within government agencies by political appointees during the Bush years, have you tried arranging to interview an E.P.A. scientist lately? It can’t happen without a “minder” on the phone. Same as it ever was….? As a former colleague and co-worker with Rick Piltz and CSW, an admirer of Andy Revkin and Dot Earth, and a climate science/policy wonk going back to the late 1980s (to make clear my perspective on this) — I feel a need to speak out in defense of Piltz’s critical analysis here. The heart of this issue, the point that should cause concern among those with even a hint of political savvy, is Piltz’s assertion that “Revkin, in effect, feeds a ‘gotcha’ mentality that, in this case, will be congenial to right-wingers.” I’d even go one higher and warn that in the volatile political climate we now face — a political landscape marred by extreme right wing infusion of Tea-Party-Palin-Angle-Buck-O’Donnell-Beck-Limbaugh-O’Reilly flavors and disfigured by corrupt corporate power hopelessly addicted to a fossil fuel driven economy come hell or high water (or both) — it is dishonest and even dangerous to lump Obama and this one incident in with the poorly documented but ever so real Bush/Cheney-sanctioned indefatigable global warming denial machine apparatus. Like throwing bloody chum overboard into shark-infested waters, it’s risky, at best. That said, Carol Browner has skeletons in her closet and an imperfect track record on climate and energy. She’s a political animal too. And there is plenty of reason to shine a bright light on the Obama White House’s communications around the BP blowout and ensuing impacts to Gulf victims and entire ecosystems affected. BP had everyone by the “cojones” as BP was the only entity with sufficient resources and skills to run the cleanup, or so they wanted everyone to think. Migrating a sentence in a press release to imply endorsement of a political decision has become, sadly, as common as breathing in Washington DC, which doesn’t excuse it: it’s still wrong and sometimes even unconscionable. But, this one instance should NOT be equated with the systematic, well-organized, corporate-motivated, diabolical modus operandi of Bush dynasty chronies and the whole Cheney/Halliburton/Sadam-Hussein=9/11/liar-liar-liar apparatus guided by the tactical strategical advice of now-Fox-commentator/Republican fundraiser Karl Rove. This group, which at one time included former American Petroleum Institute attorney Phil Cooney and a cast of other shady characters, systematically and unjustifiably attacked not just climate science, but climate scientists themselves. These attacks included threats of bodily injury and attempts to discredit and trash the reputations of people just doing their best to understand how our complex climate system actually works when the atmosphere is super-saturated with gases that trap heat. This “same as it ever was” mentality is unexpected and alarming to hear from a journalist of high sophistication and a long track record of covering the way climate change is communicated by those with a stake in seeing to it that accuracy gives way to blurry obfuscation intended to confuse and thus paralyze society. To fail to discriminate between the Obama and Bush administrations on this most central theme is to be careless and, frankly, unfair. But please do not mistake me for a die-hard Democratic cheerleader: like many independent thinkers, I too am disappointed at deep levels with the Obama administration, and take issue with many of our current President’s actions and failure to act on key issues. Nevertheless, Piltz has a valid point, one that goes straight to the heart of journalistic integrity. It should not have to be said there that too broad a brush, even if it has a catchy name, is the enemy of the truth. I, for one, would like to see a finer point put to this question in a future Dot Earth post. Alas, this is another example of false equivalence that emerges when journalists seek “balance” on topics that don’t fit into that framing. We all agree that the end result of the rewriting of the oil spill document created a false impression, and that this was a bad thing (the administration admitted this and apologized). But Andy acknowledges that the episode from the Obama team is an “isolated” one. Unfortunately , his post conveys the impression that this isolated example is somehow equivalent to the previous Administration’s extensive manipulations, and as Rick and Anne point out, that’s just silly. You don’t see the Bush people apologizing for anything, do you? Didn’t think so.